Today, the key events for the fire departments responding to an incident (en-route, arrived, cleared, back in the station) are radioed to the 911 center by firefighters in the engine at each key event. The firefighters use their physical senses to track statuses of handling the incident. Today, a responsible person makes a radio call to the 911 center for each key event and reports the code “en-route” or ” ” arrived” etc. The current system is inconsistent and depends on human factors a lot. The firefighters are obliged to produce extensive mandate National Fire Incident Report System (NFIRS) reports after returning back from the incident scene. That requires the two-step engagement: first – at the incident location jotting down the notes at the scene; second – re-entering that information into the database. The extensive part of the work is being done manually. The Dispatch center is not getting accurate and real-time information about the facilities employed at each incident. The detailed and timely data about the allocation of resources is in a great need. 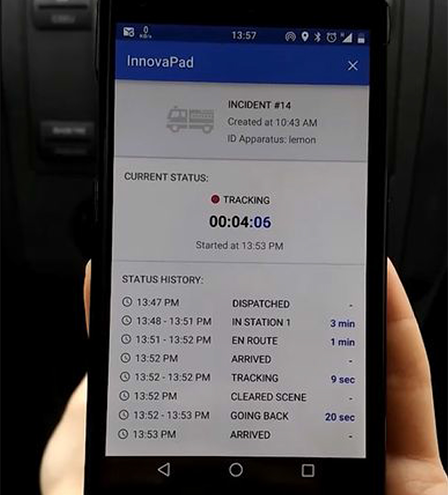 The Sirin Software developing team produced a system based on mobile application and browser-based Admin application helps build the automatic mobile solution for consistent tracking and recording all key events of the incident handling, storing the incident details in the innovaPad cloud server, instant and effective communication with the database. It enables the Scene Commander to view all the assets in real time and manage the incident scene. The solution also provides the delivery of the automatic reports right after the incident and offers user-friendly interface to track the current state and the history of each incident, apparatuses, firefighter, etc. The system demonstrates the use of beacon technology (sensing location, proximity, motion, etc), GPS (geo-fence latitude/longitude) and a smart mobile device application to automatically track firefighters and fire engines and upload data to cloud servers. It includes a browser-based application on the Scene Commander‘s iPad to let him view the assets at his disposal and manage the incident scene. The system itself can be extended to the district, municipality, state and country level. The everyday operations of the Fire Departments and Dispatch center will benefit from the real-time data collection. Improves the operations of the Insurance Department in charge of automatic filing of claims to recover accident cleanup on behalf of the Fire Department. “Active-to-the-Antenna” solution enabling two-hour survivability, supervision, and ease of engineering and installation at a lower cost than other solutions. Additionally, it provides an IoT wireless network by LoRa to cover an entire building for consumer purposes. Wireless configuration manager application by which the user only has to plug in a device and wait for a few seconds for the device to connect automatically. The solution should be easily-installable and should establish a secure connection outside of the customer’s private network. An In-building Two-Way Radio Communications Enhancement System with a dedicated radio console and cloud solution. It was certified US FD by UL and FCC. We were responsible for all phases of hardware and software development, which was designed from scratch. Functional interface with the touchscreen which provides ease in working with a 3D scanner. Hardware notifications, warnings, and errors can be read out from the PLC. The project was implemented with a hard deadline. Since the previous contractor couldn’t accomplish the task we should present the ready-to made solution very fast. Gateway with several configurable WAN options, LoRaWAN network stack, specifically designed for outdoor applications. The gateway was used both in places which don’t require additional connectivity features and places with challenging terrains where no ethernet or WiFi exists. A cost-effective IPTV platform ( 54 times cheaper than similar products on the market) with several services including Live TV and Live Media video on demand. Installing the device is simple, and can be installed simply by attaching the device to the users home network. .A sniffing middleware that allows to capture all wi-fi probe requests near the access points. Server side is implemented as a hub collecting data where all movement is recording for marketing analyze. Access point is cheap, easy to install and maintain. The Remote Electrical Tilt Unit allows for the accurate control of antenna tilt, which eliminates the site-access requirement, allowing the tilt to be adjusted remotely from the base station control center. This allows timely response to changing capacity requirements of the network. OpenWrt based operating system running on a custom designed router with x86-64 – architecture. Sabai open OS allows to administer a network without having specially qualified staff. Is is equipped with VPN logical solutions for remote access connectivity. Solution for smart parking meters which can accept credit cards, detect when a vehicle is in a space, send notifications regarding maintenance. Parking space rates can also be set remotely for specific days, hours, or special events. Also admins can watch video recorded from security cameras. A handy solution for retailer for changing product stickers directly and as fast as possible. A system which optimizes warehouse property accounting and facilitates orders’ packaging. Mobile solution for tracking and recording all ey events of the incident handling. A mobile application for pizzeria “Bocconcino” includes a function supporting home delivery. An app-service for booking apartments; it’s an easy way to find and book apartments online. A social network for young mothers. It included advice about parenting, healthy lifestyle, discussions, and user chat. A news reader about games. All the news items are automatically being parsed from 13 popular gamer websites.